Locally advanced squamous cell carcinoma of the head and neck (LASCCHN) is usually treated with cisplatin (CDDP)-based chemoradiotherapy, except when patients are elderly or have renal, cardiac, or neurogenic dysfunction. 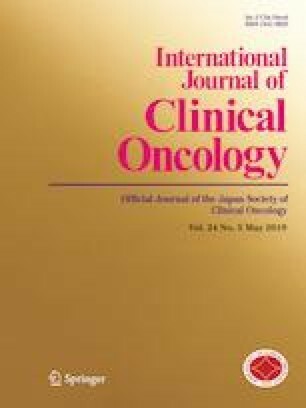 This study compared the safety and efficacy of concurrent carboplatin (CBDCA) to cetuximab (Cmab) plus radiotherapy (RT) in patients ineligible for CDDP treatment. We retrospectively analyzed LASCCHN patients who received CBDCA plus RT (n = 29) or Cmab plus RT (n = 18) due to ineligibility for CDDP treatment at two Japanese institutions between August 2006 and December 2015. Patients characteristics for CBDCA plus RT and Cmab plus RT were: median age, 74 and 75 years; 0–1 performance status, 90% and 100%; main primary tumor site, hypopharynx 52% (n = 15) and oropharynx 39% (n = 7); and stage IV, 90% (n = 26) and 50% (n = 9), respectively. With a median follow-up time of 60.0 months for CBDCA plus RT and 53.6 months for Cmab plus RT, 3-year locoregional control rates were 56% versus 58%, and median progression-free survival was 42.7 versus 11.6 months. CBDCA plus RT was associated with more grade 3/4 hematologic toxicities, including neutropenia and thrombocytopenia, whereas Cmab plus RT was associated with more grade 3/4 oral mucositis and radiation dermatitis. CBDCA or Cmab as a concurrent systemic therapy with RT is a possible treatment option for LASCCHN patients ineligible for CDDP treatment, although attention to hematological toxicity should be paid.